HD Safes – High Security Fire & Burglary Safes | Brown Safe Mfg. Even the most sophisticated anti-theft features are ineffectual when used by a safe with a weak foundation. The first line of defense for any security safe's construction is its door and walls. One substantially thick steel door and five thick steel walls are the only fundamental means of preventing a determined criminal from gaining entrance. Through clever and immoral marketing, safe builders have mastered the ability to bury this plain and simple truth in a barrage of technical terminology and captivating graphs. Wall and Door thickness cuts to the core of a high security safes construction and core ability to protect. This should always be your number one concern when deciding on any safe. Below you'll find a summary of industry recognized safe steel thickness ratings and the level of real world protection you should expect from each. No Recognized Rating - Nearly half of all top selling safe brands fall into this category. The only rating they bear, if any, is based on a system the manufacturer creates on their own that has no correlation to any industry recognized standard. This is an avoidance tactic used to mask safes that provide an unacceptable level of protection. Avoid these safes. Theft Resistant - This rating simply acknowledges that the safe has a lock on it, no other protection level is guaranteed or implied. This type of safe construction provides roughly the same level of protection as a locked file cabinet, which can also carry this same rating. RSC (Residential Security Container) (TL-5) Rating - This is a UL rated container that certifies the "safe" is capable of withstanding a beating by one man wielding a hammer and small crowbar for up to five minutes. Another way of putting it...One man armed with only a hammer and crowbar can generally gain access to these home security safes in just over five minutes. Safes bearing this safe construction rating make up the remaining half of top selling safe brands, with very few exceptions. Do not put anything of value in these safes. "Safes" or containers of this type tend to list their steel thickness by gauge. Common gauges range from 10 to 20 (see the chart above to see how incredibly thin this really is). Due to the high cost of steel, many of these same companies will combine the measurement of their steel plating thickness with the thickness of their drywall fireproofing panels, reporting one combined measurement in a manner that intentionally sways the uninformed buyer into assuming the quoted wall or door thickness is all solid steel or a similar protective material. This one underhanded trick has met with such resounding success it has been adopted in various forms by nearly every major safe builder. The easiest way to spot these counterfeit safes when uncertain about the reported steel plating thickness is to check the safes weight. A 60 inch tall false safe will weigh between 300 and 800 lbs with fire protection. True security safes of this size start at 600 lbs without fire protection and jump up into the 1500+ pound range with fire protection. Class B Rating - Weighing in at 2 to 4 times the mass of an RSC safe, Class B security safes are a vast step up in protection. A Class B high security safe is equipped with a 1/2 inch solid steel door and 1/4 inch solid steel walls on all 5 sides. At it's core, this is a safe with a substantial foundation, one capable of easily resisting hours of brute force abuse by amateur criminals. These safes will generally be capable of withstanding entry attempts by semi-skilled criminals for an hour or more depending largely on the types of tools used to attempt entry. Security safes outfitted with additional burglary countermeasures will withstand even skilled attackers for sustained periods. Class C Rating - Double the weight of a Class B with double the steel thickness all around. Class C security safes are yet another major upgrade in protection with a 1" steel door and a 1/2" steel body. A Class C security vault provides roughly double the penetration protection and tend to have roughly the same amount of added burglary countermeasures as class B rated security safes. 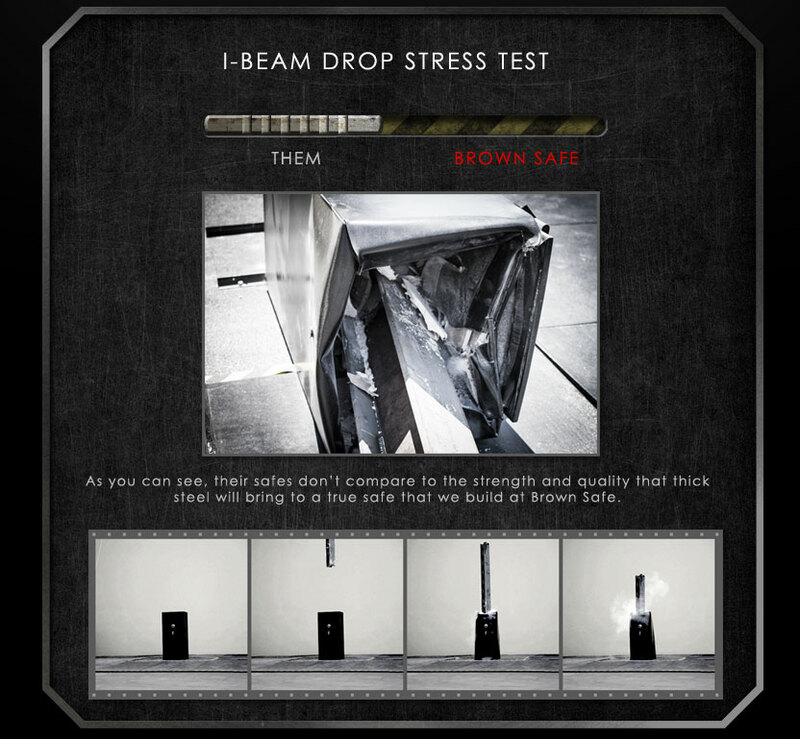 Class F (TL-30) rating - These security vaults have been tested to withstand attack for at least 30 minutes by a group of professional safecrackers armed with blueprints of the safe using the full gamut of tools and attack methods. The steel on Class F security safes often incorporates additional layers of varying metal aimed at further slowing entry attempts. In addition, Class F high security safes commonly employ additional features to further slow down professional attackers. A whole array of measures and counter-measures come into play at this level of the safe vs. safecracker game and safe builder defense methods vary widely in their approach and design. Class M rating - The M rating is the highest non-custom security safe rating Brown Safe offers and one of the highest protection levels available anywhere. M rated security safes are currently only manufactured by Brown Safe. To learn more about this rating, click here. It starts with steel. A safe is really only as strong as the material used to construct it. All Brown Safes are constructed using a highly reinforced interlocking six-sided construction method. All wall, ceiling, and floor intersections are bound both inside and outside with high strength arc welds. This includes seamless welds that run along all outside seams creating a fully enclosed armor casing. The five walls of this base unit are comprised of quarter inch solid plate steel. Again, this is substantially more protection than the majority of top selling safe models. Click here to see a competitor comparison. The safe is made fire worthy by encasing all walls within 2 ½ inches of poured composite amalgamate encasement and the door of the safe receives a 2 inch layer of the composite material. While it's impossible to create a truly "fireproof" safe, this is the maximum level of fire protection available and provides an additional benefit by increasing the burglary shielding. To learn more about the composite encasement process, click here. The door frames on most safes are normally vulnerable to prying and side drilling. Not the case with Brown Safe door frames that contain excessive reinforcement in this area. Our safes incorporate a box in frame design that carries quadruple the body steel thickness at the door's frame. In addition, the solid steel reinforced door interlocks within the door frame, creating a flush surface of solid steel that prevents the insertion of any pry bar or hydraulic leverage mechanism. To top it off, a hardened steel internal crossbeam positioned at a 45 degree deflective angle runs along the entire door bolt frame to repel side door drill attack attempts. A solid steel tongue runs the entire length of the inner door parallel to the hinge. It locks in securely behind the door frame when the door is fully shut interlocking the door and frame tightly together. Once closed and engaged, this jamb coupled with the flush frame design and hardened locking bolts creates a door capable of withstanding extreme forms of attack for extended periods of time. With the inner jamb in place, any effort spent cutting the doors exterior hinges wastes valuable time for the criminal while gaining them nothing. This commercial rated lock offers quick and convenient access with industrial grade protection. Built by one of the most respected lock makers in the safe world, this is a high use lock designed to provide a century's worth of reliable operation by jewelers and security personnel. This time tested design means ultimate home reliability for you. This large hard plate rests between the door and the lock creating an additional barrier against penetration attacks. The superior bearing design is comprised of staggered rows of through-hardened ball bearings with a 58Rc hardness rating. The harsh angles and hardness of the bearings act to bind and seize drill bits while the free spinning nature of the bearings prevent a drill bit from gaining a solid drilling surface. The locking bolts responsible for securing the door are fastened at two distinct locations along each bolt. Each paired set of solid steel anchors is spaced wide apart for additional support. The carriage anchors are held fast directly to the plate steel door by seamless welds. This robust method of bolt carriage reinforcement is rarely seen in the safe industry. The majority of safe companies hold their bolts using a single thin carriage anchor, making the safe extremely vulnerable to pry bar and leverage based attacks. Click here for an example of this vulnerable bolt carriage design. A solid safe requires solid bolt work, and our bolts deliver. Each case hardened locking bolt runs directly through the carriage anchors. While the locking bolts on most safes terminate just inside the door, each Brown Safe bolt runs over half the length of the door passing directly through the wide set bolt carriage anchors. While in the locked position, each bolt is equipped with a passive anti-drive mechanism that blocks any attempts to mechanically force the bolt back through the use of wedges, taps, drills, and hammers. Click here to learn about an unscrupulous "Large locking bolt" gimmick commonly employed by many major safe manufacturers to create the false impression of a robust safe. Hardened relocking bolts positioned at key locations throughout the safe act as an end all failsafe against intrusion. If an attempt is made to penetrate the lock, all relocker bolts instantly engage permanently pinning the door and its main bolts solidly in place and making it a near impossibility to get the door open within any reasonable remaining time the criminal may have. Once relocker bolts have activated, the safe must be opened by a certified locksmith using blueprints supplied by Brown Safe specific to that safe. Without these detailed prints and instructions, it takes numerous hours to gain access to the safe, ensuring the safety of the precious contents within. To best ensure a solid floor connection, all Brown Safes are installed using four massive floor anchors. During installation, these long bolts run through anchor holes in the safes steel floor plate securing the safe firmly to the wood or concrete floor. When anchored to a concrete floor, the thief would have better luck attempting to uproot the entire concrete section around the safe rather than trying to pry the safe from its substantial purchase. When anchored to a wood floors support beam, it would be necessary to remove the entire section of floor including the beam in order to dislodge the safe. These are lengthy major operations that in most instances criminals have neither the time nor resources to perform. With twice the amount of door steel as the B-Rating, C-Rated safes present a substantial protection upgrade. The C-Rating also doubles the amount of body steel to a 1/2 inch of solid body thickness. The total protection offered by the increased door and wall thickness is essentially double that of the C-Rating. Twice the steel means a door that's twice the weight. To better accommodate the added mass, we upgrade the door hinges to high load-bearing ball and roller hinges. The result is an exceptionally fortified door with silky smooth operation. the entire front area of the safe. To learn more about the capabilities of this armor, click here. F-Rated safes weigh in with a door that carries triple the steel thickness of the base rating. While only a quarter inch thick, the extreme strength of this added layer provides a substantial increase in protection from penetration attacks. The Ballistic Armor is cable of defeating multiple .50 caliber anti-sniper rounds, a feat no other steel we've tested is capable of performing. Attempts to penetrate this armor with carbide tipped drill bits also prove fruitless as the armor hardness is an even match to that of the bits. The body of F-Rated safes is also comprised of solid steel plates that are three times the thickness of the standard B-Rate model. We do offer additional non-standard protection levels above and beyond those shown here. entire front area of the safe. To learn more about the capabilities of this armor, click here. Both upper and lower locking bolts are added to further strengthen the door's ability to deny all attempts to wedge and pry the door open. All bolts also gain an improved dynamic anti-drive design that makes it unfeasible to force any bolt open through mechanical or hydraulic means. Gain an added level of penetration protection through the addition of a glass plate to trigger the relockers. This pane of tempered glass shrouds the safe's lock. Any effort to punch, drill, torch, or in other ways access the lock maliciously results in a shattered plate. The instant this plate fractures, all attached relockers engage, sealing the safe off to all means of entry. Triggered by either a hidden button, or an alternate unlock entry code, safes equipped with the silent signal alert feature interface directly with your alarm or home automation system. With the silent signal in place, if the user is ever in a situation where the safe owner or operator is forced to open the safe against his or her will, the safe opens normally while at the same time an undetectable alert is sent to the homes monitoring system which in turn relays a message to the authorities or other security personnel, letting them know a holdup is currently taking place. At Brown Safe, protection has been, is, and always will be our number one priority. Our dedication to this core value has earned Brown Safe an industry-wide reputation for secure safes. If you haven't browsed the "Protection Levels" pages within the "Safe Buying Guide" section, we highly suggest you do, as insufficient safe protection is the number one issue that is currently plaguing the safe industry. Our starting safe models come with a half inch thick solid steel door and a quarter inch thick solid steel body. Even the top rated safes by the majority of safe builders don't offer this much protection. Brown Safe's security ratings are detailed below. Each section describes the security features that come standard with each protection level we offer. Higher protection levels include all features from the previous level in addition to those listed. We can also provide custom safe protection levels above those listed here... call us anytime as we're always happy to discuss a safe to fit your needs. Optional protection features and security countermeasures are also listed below. With twice the amount of door steel as the TL-15, TL-30 safes present a substantial protection upgrade. The TL-30 also doubles the amount of body steel to a 1/2 inch of solid body thickness. The total protection offered by the increased door and wall thickness is essentially double that of the TL-15 rating. HD Ultra safes weigh in with a door that carries twice the amount of door steel than the base rating, plus a layer of military-grade ballistic armor. The extreme strength of this added layer provides a substantial increase in protection from penetration attacks. The Ballistic Armor is cable of defeating multiple .50 caliber anti-sniper rounds, a feat no other steel we've tested is capable of performing. The body of HD Ultra safes is also comprised of solid steel plates that are three times the thickness of the standard HD model.